I got a new set of sugar skulls in August. I wanted them to be colorful, but I did not have time to color them with markers or pencils. ANY STAMP COMPANIES LISTENING?? I truly love the sugar skulls and Dia de los Muertos images. 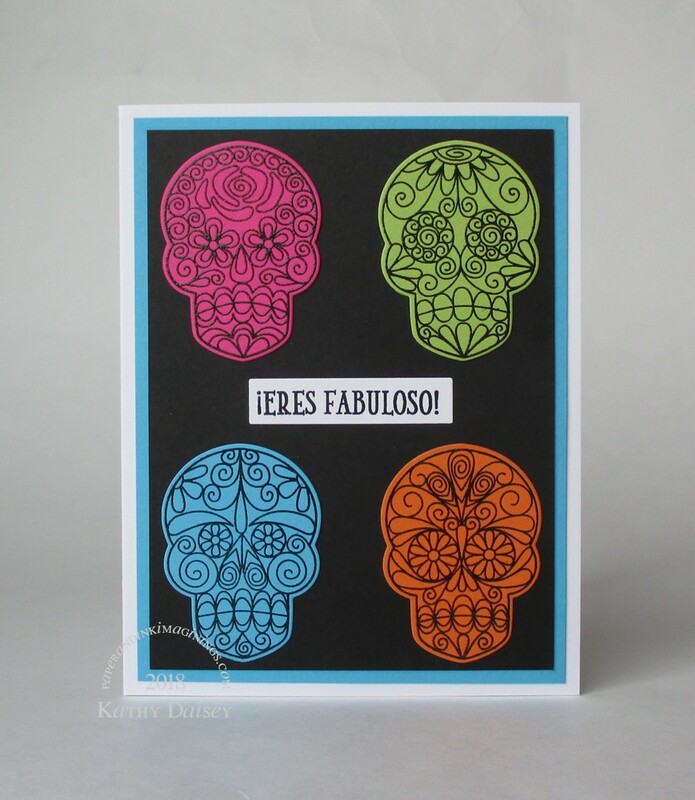 Can you include sentiments that go with Dia de los Muertos??? PLEASE?? Supplies: Stamps – Hero Arts, Newton’s Nook, paper – Neenah Classic Crest Solar White, PopTone Razzle Berry, Sour Apple, Stampin’ Up! Basic Black, Pumpkin Pie, Tempting Turquoise (retired), ink – VersaFine Onyx Black, dies – Newton’s Nook (skull), Spellbinders (rectangle), embossing powder – Stampendous Detail clear. Categories: card, caring, encouragement | Tags: card, Hero Arts, Neenah, Newton's Nook, Poptone, Spellbinders, Stampin' Up!, Tsukineko, VersaFine | Permalink.